Place quinoa in fine-mesh strainer; rinse well under cold running water. Bring 2 cups water to a boil in small saucepan; stir in quinoa. 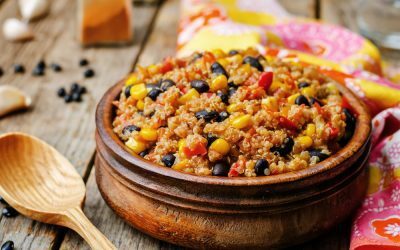 Reduce heat to low; cover and simmer 10 to 15 minutes or until quinoa is tender and water is absorbed. Stir in 1 tablespoon lime juice. Cover and keep warm. Combine sour cream and remaining 1 tablespoon lime juice; set aside. Meanwhile, heat oil in large skillet over medium heat. Add onion and bell pepper; cook and stir 5 minutes or until softened. Add garlic; cook 1 minute. Add black beans and corn; cook 3 to 5 minutes or until heated through. Divide quinoa among 4 serving bowls; top with black bean mixture, lettuce, and sour cream mixture. Garnish with lime wedges. Exchanges per serving: 1 fat, 3 starch.